For more than 100 years, Normandin, Cheney & O’Neil, PLLC has championed the rights of clients by putting the power of our experience and excellence to work. A mid-sized firm, Normandin, Cheney & O’Neil, PLLC is capable of taking on even the toughest adversaries and the most sophisticated matters with its team approach to problem solving. At the same time, the firm has remained small enough to provide the kind of personal attention and responsiveness our clients have come to expect over the years. Martindale-Hubbell, the leading source of reference information for the legal profession, has awarded the firm with its highest rating. Normandin, Cheney & O’Neil, PLLC is also included in Martindale Hubbell’s Bar Register of Pre-Eminent Lawyers. More importantly, the firm has an excellent reputation among those who matter most – our clients. 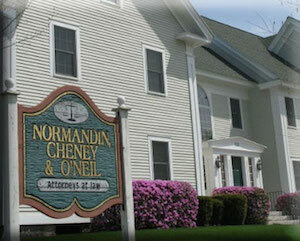 Normandin, Cheney & O’Neil, PLLC has been recognized for its stability. There has been little turnover, resulting in the formation of long-standing professional relationships between attorneys and clients. Over the years, we have represented a wide variety of clients from individuals to multimillion dollar corporations, offering specialties in a broad range of practice areas.